The U.S. Mint is taking orders for a new Braille silver dollar, but many blind people won't be able to read it, as fewer than 10% of legally blind Americans can read Braille. 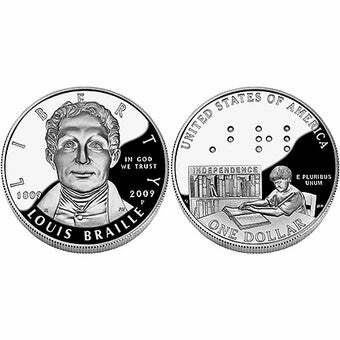 To commemorate the 200th birthday of Louis Braille, who invented system of reading and writing used by the blind, the 400,000 coins have been minted featuring his portrait on the front, and the letters "BRL" in Braille on the back, according to CNN. The coins are meant for collectors and will not circulate. The U.S. Mint says the National Federation of the Blind can receive surcharges from sales of the coins to continue its programs to promote Braille literacy. According to a report released by the organization today there are 1.3 million legally blind people in the United States, but only 10% can read Braille, and fewer than 10% of blind children are learning it, reports USA Today. "They were both wrong. And the current technology isn't going to make everything all right unless I know how to put my hands on a page that has words on it and read them." Studies have found that relying on technology alone instead of Braille leaves many blind people illiterate and less likely to go to college, find jobs, and live on their own. Overall 70% of blind adults are unemployed, but one study found 44% of adults who grew up reading Braille were unemployed, compared to 77% who could not read it. Some parents don't want their children to be stigmatized by relying on Braille books, but many blame the decline of Braille literacy on poor and inconsistent instruction. According to the National Federation of the Blind there are not enough teachers certified to teach Braille and often the instructors have to shuttle from school to school. "You can find good teachers of the blind in America, but you can't find good programs," said Maurer. "There is not a commitment to this population that is at all significant almost anywhere."